The party alleged that the leadership of the ruling party in the state, Peoples Democratic Party (PDP) largely compromised officials of the Independent National Electoral Commission (INEC) and security agencies to carry out the electoral fraud which only favoured the PDP candidates. The party also promised to release crystal photo/video evidence where and when necessary to buttress its claims. This was released in a statement signed and made available to newsmen by the Director General (DG), Delta State APC Campaign Council/Great Ogboru Campaign Organisation, Hon. Timinimi George on Tuesday. The party therefore called for an outright cancellation of the results announced in affected Local Government Areas, LGAs. “There was no election in the riverine areas of Delta South. What happened was daylight robbery and a shameless effrontery on our nascent democracy. The PDP leadership in the state largely compromised the military and police operatives deployed by authorities to ensure a free and fair elections. 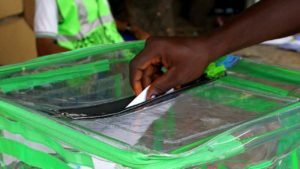 In Delta South, in the riverine areas of Burutu, Bomadi and Patani LGAs, the PDP leaders hijacked ballot papers and thumb printed massively in favour of their party and candidates, said the DG. “The venue of their thump printing is like a massive polling centre with many men and women aggressively carrying out this criminal act . I have enough video to buttress what i am saying,” George stated. Speaking specifically on the affected areas where the alleged fraud took place, the DG in the statement said: “In Warri South West Local Government Area at Ogbe-Ijoh, in ward 1 of unit 005, 006, 007 and 008 in the riverine areas of the LGA, elections were characterised by massive rigging in connivance with INEC officials. There were also hellish thuggery, harassment and intimidation of voters and agents. These criminal acts were also awfully manifest in Gbaramatu, Oporoza , and Isaba wards of same LGA. Burutu and BOMADI LGAs and the Riverine areas of Patani LGA also shared in the barbaric and mindless rigging with the attendant violence. Tragically, in the few Units and Wards where few electoral materials were present, the result sheets for the units were missing completely. I therefore call on the Independent National Electoral Commission (INEC) to outrightly cancel the elections in the aforementioned LGAs.” The immediate past governor of Delta state, Dr Emmanuel Uduaghan contested forthe Delta South Senatorial election under the APC and lost to James Manager of PDP. In the same vein, in Ethiope West, an APC chieftain narrated how a former PDP governor of the state gathered hundreds of young men and thugs solely for the purpose of thump printing in his house. “This was a man that was subjected to all sorts of shame locally and internationally not long ago. Still he wouldn’t leave politics alone, live quietly and save what remains of his honour. Imagine, after thump printing he brought out nine Hilux vans loaded with compromised soldiers and some thugs and they carried these thump printed materials to the Collation Centre. And this was the result the INEC officials announced because they had been terribly compromised. It was simply unbelievable, really sad,” he lamented.